The One City One Pride LGBTQ Arts Festival kicks off tonight, on Harvey Milk Day, and continues through the end of June with workshops, exhibitions, talks, performance, and more. Beginning tonight and running through the end of June, the city of West Hollywood will celebrate Pride month with 40 days of art, performance, film, and literary events. Organized by WeHo Arts, the One City One Pride LGBTQ Arts Festival kicks off tonight, on Harvey Milk Day, at the Abbey Restaurant & Bar with an artist-led sign-making workshop in preparation for the Resist March on June 11. 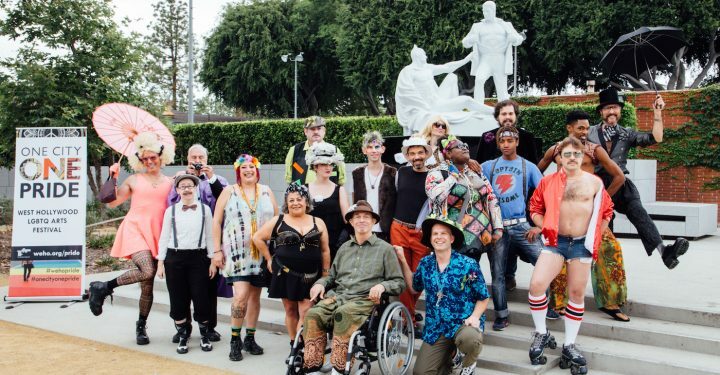 The theme of this year’s festival is “Go West,” focusing on California’s historic role in gay liberation and empowerment. Other notable events include a theatrical LGBTQ History Tour on June 3, written by the late, celebrated author Stuart Timmons; Migration of the Monarchs, a three-part costumed performance by trans artist Yozmit that fuses Cabaret with Butoh and Kabuki; the exhibition Lesbians to Watch Out For which explores the history of ’90s queer activism in LA; and the world premiere of Jeanne Cordova: Butches, Lies, and Feminism, a new documentary about the life of this influential activist on June 29.